Airplanes don’t typically come to mind when people think of ocean science. But for 25 years, beginning in 1945, Woods Hole Oceanographic Institution (WHOI) maintained five planes for research. Ed Denton, who retired from WHOI in 1995, was hired three decades earlier to transform a former military plane into a flying oceanographic research machine, tailoring it for scientists’ needs. It was a loss for scientists, he said. 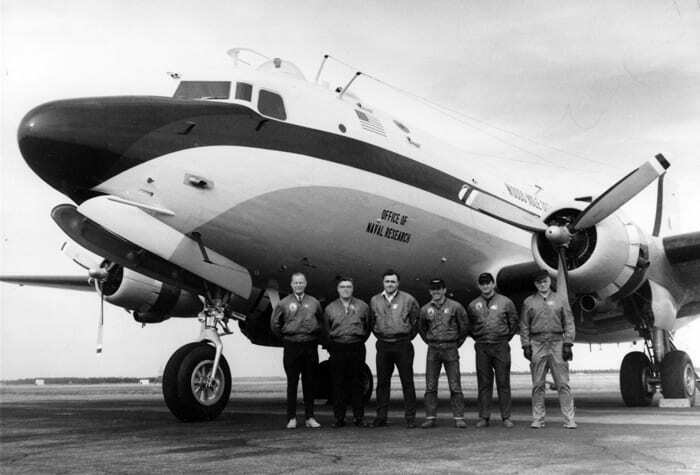 They used the plane to cover vast areas of ocean in far less time than on a research vessel, for a variety of missions. One marine meteorology group at WHOI used it to study colliding air masses (better known as turbulence). Other researchers collected data that ground-truthed satellite imagery, or chased buoys launched from ships. Another group took sea surface temperature measurements, which helped them to understand and better predict coastal cyclones and monsoons. In early April 1997, Denton was visiting a friend who had moved from Cape Cod to California. One day, while his friend went golfing, Denton decided to tour the Aerospace Museum of California in Sacramento. 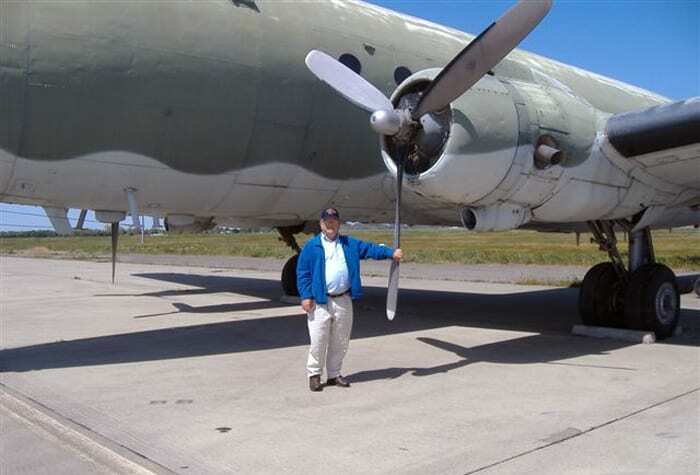 He read the red plastic placard on the stand in front of the plane, titled C-54D Skymaster, and stopped at the words indicating that its final assignment was with the Office of Naval Research in Boston. “Whoops, I thought. Wait a minute. That was our sponsor,” Denton said. “At that point I began to reread the specs. Holy cow, there it was, the registration number staring me right in the face—50874. It’s a number I know like my own birthday. I think I went into slight shock. Here she was, 27 years after leaving Otis Air Force Base (on Cape Cod), still in one piece, standing there, and looking good. It was the aircraft that was responsible for my 32 years at WHOI,” he said. Denton rushed around examining the aircraft, finding old hatches he had created for cameras that photographed clouds, locating antennas he had mounted on the craft’s belly, and pointing at holes he had drilled in the Plexiglas windows so scientists could poke thermometers through to measure air temperatures. “It all came back in such a rush I was literally moved to tears,” Denton said. He walked to the museum office and asked if they ever opened the cockpits. A volunteer, moved by Denton’s emotion and sharing his excitement, found the aircraft’s key and pushed a stand alongside the plane so they could climb inside. There was an electronics box mounted on the left side of the aircraft (part of the fuselage) that recorded signals from various scientific equipment connected throughout the airplane. Electrical panels that powered scientific equipment were still there. All the navigation electronics stood in place, as Denton had left them. 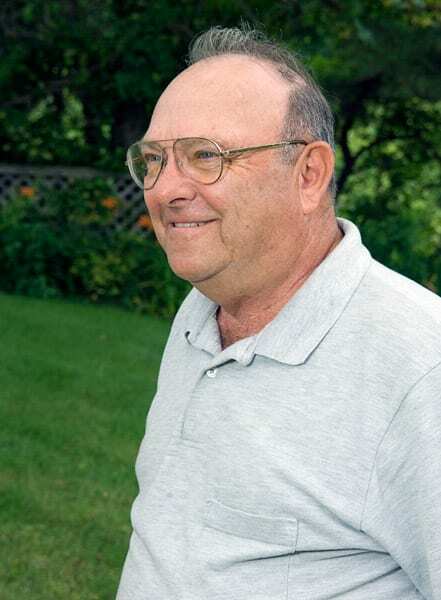 Denton began with a call to a former navigator on the plane, Hal Merry. Merry had a pilot’s license and access to Federal Aviation Authority records. “Turns out my old friend the plane had had a real colorful history after leaving WHOI,” Denton said. After storage in Arizona, the plane was sold to a private company in Texas. It then ended up in South America, where it was used to smuggle 9,820 pounds of marijuana into South Carolina. The six smugglers were caught, and the arresting sheriff was then empowered to sell the plane. The plane’s next owner leased it to the U.S. Forest Service. “They painted it brown, strapped a 2,000 gallon tank underneath it, and turned it into a water bomber to fight forest fires,” Denton said. A short time later, the Forest Service swapped the plane for a newer type of aircraft, and the plane was donated to the Aerospace Museum of California, where it has been on display ever since. Museum officials say they have plans to restore the plane to show how it was used for oceanographic research, but currently they lack funding. 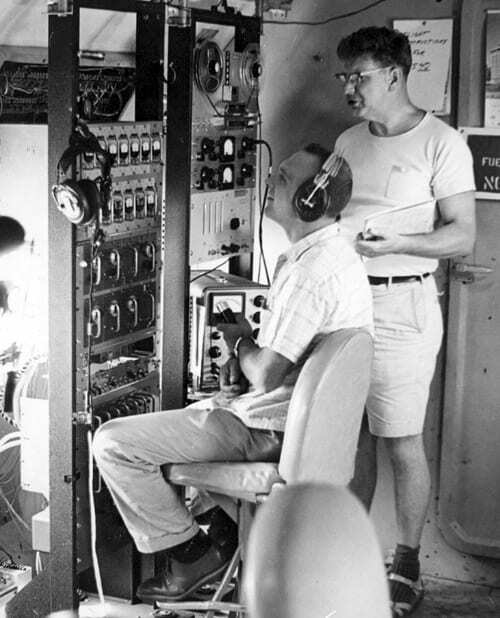 In 1964, while flying over the Indian Ocean, engineer Ed Denton (seated) and WHOI scientist Andy Bunker monitored records of scientific and atmospheric information aboard the C-54 airplane, including temperature, humidity, wind speed and direction, the aircraft's speed, and compass bearings. All the information was recorded on analog tape for further analyses back at WHOI.